Since its inception in 1982, the Greater Baton Rouge Business Report has been committed to delivering accurate, honest and in-depth coverage of the Baton Rouge business scene. After many years and hundreds of issues, our publication not only continues its mission, but also has exceeded expectations by becoming a true partner to business and the community. As a key business resource, we will continue to strive for excellence in our company and our city. We believe improving Baton Rouge is everyone’s business, and we’ll always be here to lead the way. Invaluable resource. Business partner. Community leader. The Greater Baton Rouge Business Report is dedicated to being more than one of our nation’s finest local business news publications. We are an asset to everyone who lives and works in the Capital City because we play an active role in local business development—and we’re proud of that. It is with this attitude that we begin each day. And, as business partners with the community, we can further Baton Rouge’s reputation as a progressive city with an active environment for commerce. Penned by a national award-winning editorial staff, Business Report has become required reading for area professionals, executives and small business owners. We deliver the business news first, spotlighting the local players, keeping a finger on the pulse of the economy and “putting a face” on business issues. What distinguishes Business Report‘s brand of business news coverage? We provide our readers with the absolute latest “scoops” and in-depth coverage. And we don’t just report the facts; we also explain the news and analyze the trends. We know that you don’t have time to seek your news from a variety of publications. Our goal is to provide a single source for business news to keep our readers abreast of trends and help them remain competitive in the local, state and global markets. Business Report is proud to consistently deliver a product that is lively, informative and, above all, fair—encouraging readers to see all sides of the issues and make educated and informed decisions. Business Report is a franchise that has assumed a leadership role in the Capital City. As a business partner, we serve as a catalyst, providing resources and opportunities that enable your company to thrive. This unique philosophy has afforded us the chance to work closely with local business people to help shape our city. Since 1982, our publication has been instrumental in establishing unique business events that have recognized excellence and created opportunities for business development. 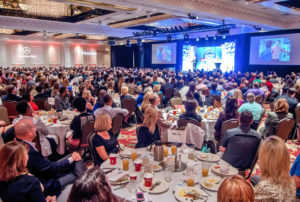 The Business Awards & Hall of Fame, Influential Women in Business and Top 40 Under 40 are some of the most anticipated annual events of the business community. Get the details about all of our events. In addition to founding, organizing and actively supporting corporate events, Business Report has always been dedicated to the city that has supported our growth. And we know that the role of a good corporate citizen is not only integral to our professional involvement with Baton Rouge, but is equally fulfilling on a personal level. That’s why, each year, we furnish thousands of dollars worth of advertising space for nonprofit organizations, donate funds to charitable events and provide assistance to a variety of community groups whose activities make Baton Rouge a better place to live and work.